Last June, I wrote about “my greatest reward of learning investment” in one of my article titled “The Fallacy of "How to be Rich" from Investing in Shares (Part 2)”. I mentioned back then, that my stock investment did not increase my material wealth significantly since I started in 2010. Even if it did, it was a humble one, unlike the extravagant rewards you often hear on the advertised courses. This is considering the fact that I did spend a considerably huge amount of time and effort into mastering the art of stock investment. Furthermore I do have an advantage, being exposed in “real life” to many of the businesses I invested and also having the so-called “insider” news. Despite the effort and the edge, the rewards were nothing to shout about. I admit I am not the guru, but then, how many of the mainstream are really guru? Never mind the not so lucrative material benefits, the intangible benefits are invaluable. Back then, I gain knowledge over various types of businesses. I have a better overall picture of the World and S’pore economies from digging into the history of the world. I also learnt that the mainstream is usually wrong. My temperament improved and patience develops. Most important of all, I learn to be a better person from reading and learning from the biographies of many famous or infamous people. Due to a series of revelations in my life lately, it also triggers my fervor to share more thoughts in this article as follows. I still did not grow very rich materially from investment. Even if I did, it is no longer so important as these are just temporal in life. You cannot take the wealth of this earth when you depart from the world. Over the years, I had personally known many people who were very successful in their careers. It includes those who are very wealthy. However if we sometimes dig deeper into their lives, many are struggling with health and relationship issues that money cannot settles. It came to a shock to me that recently a wealthy friend and client of mine had passed away. He was only in his early sixties. He was always cautious about nutrition of food, exercised regularly. He had his own business, which is also pretty stable that he did not need to work extremely long hours. Nonetheless, he was still ambitious wanting to grow his business and wealth for his next generation. Life can end so abruptly. In another testimony, another friend of mine in his late thirties, who has a credible job and happy family collapsed one year ago. The next moment he was bedridden with brain stroke. Today, he is still on wheelchair, with an uncertain future. Then I also knew that there are those who indulged all their life in growing material wealth, whether in career or business or in investments, but their relationships with loved ones or people around them are never something to be proud of. The many human issues that we faced today are often a consequence of our “ignorance” despite the worldly wisdom. For instance, I suspect that most of us ever know that we are trapped in a prison called “self”. The contemporary society taught that in order to be successful (at least sub-consciously), we ought to have “self-will; high self-esteem, self-reliance; self-sufficient” etc, which eventually led to self-centeredness and over skepticism in people relationships! Do not get me wrong, I am not saying that we should not be responsible for ourselves, but asked ourselves, where is the emphasis on the intangibles. For example, the need of a righteous life which invariably relates to more love, care and concern, patience, kindness, generosity, loyalty, humbleness, self-control and ultimately resulting in peace and joy in life. Read my article earlier: The root cause of today's world problems! How to be saved? I am grateful to learn that one of the greatest benefits as a result of my humbled investing journey is the ability to know what is truly prosperous and good success in life. It is to be righteous and loving with good health, good relationships “vertically and horizontally” and no lacking in material life. Being no lacking in life is not solely because you are made very rich with material wealth. Instead, it entails the fact that you learnt to lead a simple and frugal life, so that you can live an enriching life even without the need of many material things. Investment widens my perspectives. I see a bigger overall picture of the world, both economically and politically. In addition, the in-depth study of history helps in the factual aspects of life. Because of learning investments, it strengthens my ability to identify the root cause of a problematic situation more easily than before. Finding the root cause of problems in life is so critical before we apply the “right medicine” to solve the problems. For example, a bad tree that bears bad fruits, you can chop off as many bad branches you want, but it will not solve the problem. Ultimately it is the main branch that is bad. Hence, finding the root cause of every problem is so important. I also use to have a quite a childish thinking. I reckon that if one is rich and successful, he or she will be genuinely wiser in life and will be able to see the root of a problem easily. In fact, many so-called rich and successful ones in the eyes of this world are often veiled to the truth of life, which eventually end up so “poor”. They are unable to discern between the righteous and sinful. They are unable to see the root of the problems in this life. - Self-centeredness, which I mentioned earlier which is also pride and ego. It is with the knowledge of the big picture, and the love of finding the root cause, that it helps to shape my character to one that is always loving to find out the truth in life and not just one that is only seeking to hearing what I love to hear. In other words, the flattery words that boost pride and ego, should be renounced from your heart! Why is the majority always wrong? Another thing I learnt is the fact that the mainstream is normally almost always incorrect over the long term. It is almost always the case as history always says so. Perhaps it can be due to the fact that mainstream always look at the short term and benefit, without the ingredients of wisdom, knowledge, ability to discern, patience, faithfulness, endurance and self-control. One example is said from Ray Dalio. He mentioned that majority of the investors are so concerned about the business cycles that they are not paying attention to the long-term debt cycle, which is nearing the end. This is because of the long period of near-zero interest rate environment that if any financial catastrophe events are to happen, the lawmakers will be without the ability to lower the interest rate, to boost the economy. Then how are we going to deal with the situation effectively? Print more again? Hence, I learn not to conform to the world and to the majority. On the contrary, I learn to always go deeper into the root to find out the truth from the very beginning of time. This really helps me to anticipate what is going to happen and also help in shaping my action now in preparation for the future. With this wisdom of non-conformity to this world and the majority, I was rescued from massive stock losses. With more prudency, I also delivered myself out from the fear or mental stresses that many of my friends are facing now because of the depressed economic situations affecting their jobs. Then comes the most important benefit - To be a better person. Sometimes one thing happened because it paves the way for another more important thing to happen. For those who read the bible, will know that John the Baptist paves the way for Jesus. Similarly to me, the intense learning of investment in the last four years is the key to unlocking the greater truth in my life to and to be a better and righteous person. And the only way to have the life that bear multiple-folds of fruits, is to have our character constantly shaped by an invisible mighty force spiritually. It is not just the talk of the mouth, nor the “membership tag” or a “outwardly uniform” you wear nor the place you goes to once a week, but the personal experience of the almighty supernatural goodness that has a profound impact in your life, that it totally transformed our mind and the way we live. It is the continuously shaping of the character that has to be from within and manifest outwardly to be a blessing not just for oneself but also for others. You may find it hard to understand. However, I will like to that say that it is the kind of experience that is based on supernatural abilities to perform healing, miracles and the restoration of relationships for others. The experience is not just for family, and myself but also for anyone who are in need of help. I am thankful about my life now. I had a great family and many good friends. I still have a good job despite the dire economic conditions in the O&G industry. I am thankful that I am revealed to the truth of this world and this life, and also revealed to the ultimate purpose of humans in this world. And most important of all, I learnt also that it is the righteous human character from the heart that counts, in which, good works will then follow and fruits in our life will blossom. Glad to hear from you. You've been MIA for a while, haha! Very nice to hear from you. Hope you are doing well, and congrats to you and family. Yes indeed I have been MIA from the blogosphere. Not because I had lost my vigor in reading and writing, but because I had find something more real and more important in my life purpose. In fact I devoted more free time now day and night in my new found purpose reading and writing and visiting many people to provide my humble help in their lives. The results are really supernatural signs and wonders in my life, with a renewed mind. And it provides me with good health, better relationships all around and more peace and joy in life. PS: Remember our date? Perhaps we shall meet soon and I will share more! Great post with lots of food for thought for me. I guess being grateful for what we already have is an excellent way to replenish willpower towards reaching our next ambition. 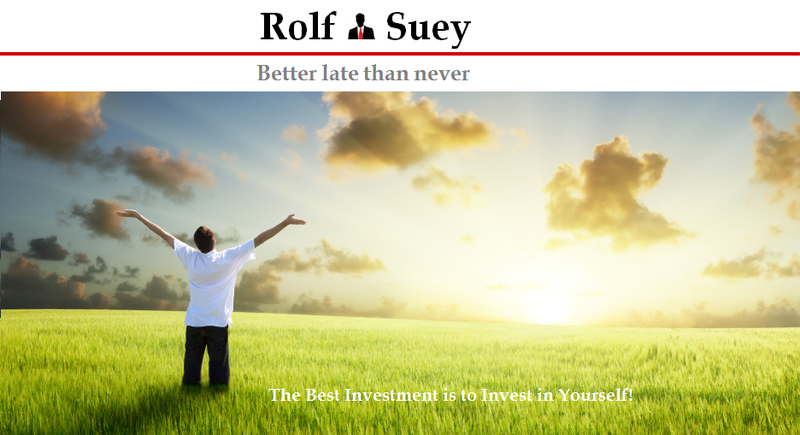 Rolf, 6 to 7 years in investing is nothing for a long-term investor. Not even one full cycle. I hope you are not getting disheartened by your little investing success. Remember the magic of compounding? The exponential growth shows its might far in the future. Nice to see you here too again. Yes I agreed that 6-7yrs is short. I am not dishearten by the lack of significant tangible success now. I am still having lots of patience waiting. Far more cash and metals now than stocks! As I mentioned, learning investment is really a stepping stone to something more important in my life. The intangible success makes me far more richer! And one big intangible success worth mentioning is getting to you, LP, SMOL, CW, temperament, SI, UIN, and all the rest of the bloggers and readers. It is really my pleasure! Thank you! Thank you for an inspiring post! Oftentimes, making investments is just impossible because people live within a strict budget. It’s hard to find money both for regular people, businesses and non-profit organizations. People take loans and have part-time jobs along with their regular ones to somehow make ends, but oftentimes this is not enough for covering their everyday needs. Look at the list of most trustful lenders from FindLender.uk and you will find the right lending company online at shortest terms. Every of us can get a support from loaners online, so remember that.